One of the principles of object orientation is that each class should have a single purpose. In this video, we restructure some of our code to use classes and put some of our leap year code into their own files. All right. Let's jump back to our code. So here in our app dot php file, we have a few things going on. Originally, we set this up in order to capture anything that was specific to our application and so we added our routes inside of here. As we went on, we added additional functionality to calculate whether a year is a leap year, and we also added a controller for our leap year page. Now, in the spirit of object orientation and splitting our code up into modular components, it would make sense to take this code for the leap year and put it into separate files. Those would then be files that we could possibly wrap into a package and distribute on packages or share with other projects. So let's go ahead and set up a new folder that's PSR-0 compatible that includes this functionality. What we're going to do is split this up into two sections. The controller will be in its own file, and then is_leap_year will be in a separate file. We'll put them both inside of a folder called calendar and then within calendar, we'll have separate folders for our controllers of which there will be just one to begin with, and then anything that has to do with our model which again is the data that we are working with and is_leap_year is a function that fits that profile. So let's go to our Resource Pack directory and we'll go to the thirty-seventh step, LeapYearController dot php moving our leap year code into a controller, and we'll copy this and paste it inside of our examples folder. This collection will not only prepare you to work with and understand Drupal 8 under the hood, it will increase your skills and relevance as a developer. We cover Object Oriented Programming (OOP), how to use Composer, what the Symfony framework is and how to use its various components, plus lots, lots more. For developers really wanting to modernize their skill set, this is a great place to start. 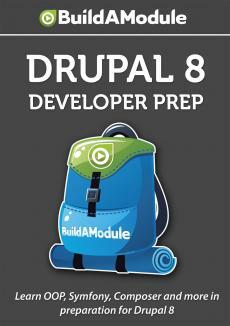 Before watching this series, you will need a web environment with Drupal 8 installed. Follow the videos in the Setting Up a Web Environment With Drupal to set up a web environment. In the series, we use a couple different versions of Drupal 8 and provide instructions for installing each one so you can follow along with the series exactly. You can also use the latest version of Drupal 8, but there will be some slight differences between what you see in the videos and how you would put what you see into practice, but working through those differences can be excellent for learning. This collection is mostly for Drupal developers who want to upgrade their techniques to work with Drupal 8. Because many of these techniques are applicable to PHP coding in general, it can also be useful if you simply want to develop your PHP skills and wrap your mind around object-oriented programming. You will get the most out of this collection if you are comfortable with procedural coding in PHP. We will make references to how code works in Drupal 7, so it will be helpful if you have some Drupal coding experience in particular. 1:50How to see what variables you have to work with in a Twig template using "dump"